The Bosch 1617EVS is a fixed base wood router that sports a powerful motor and a variable speed control. It has the same features and specs as the combo kit model: Bosch 1617EVSPK that comes with both a fixed and plunge base but offered at a more affordable price. If you are on the market for a wood router then is this model worth it? This is what we’re going to find out with this detailed review. If you want to buy a wood router, here are some reviews that I recommend to read such as Bosch PR20EVSK, Bosch 1617EVSPK, Porter-Cable 7518, Makita RT0701C, DeWalt DW618PK, DeWalt DWP611PK. The motor in this model is a heavy-duty 2.25 HP rated at 12 Amps. This power rating is enough for any type of general purpose routing and will cut through material very easily. The motor coil is wrapped around an ABS plastic layer that is solid and durable. It has an air vent at the top for good air circulation and helps keep the motor cool under heavy-duty load. Furthermore, the motor is equipped with soft-start technology. What this means is that the motor starts off slowly and gradually accelerates to your desired speed. This is a handy feature because it makes the router more maneuverable when used as a handheld device, and helps protect your material from damage. The variable speed in this model is the biggest attraction. It has a versatile speed range of 8,000 - 25,000 RPM that can quickly and easily be adjusted with the speed dial. When doing production work, the variable speed is very handy as it allows you to adapt the speed to the material. Some materials require a low RPM while others a high one. The finish is also dependent on the router speed. A high RPM will deliver a smooth and polished cut while a low RPM is ideal for removing a lot of material fast and deliver a coarser finish. In addition to the variable speed, the 1617EVS has Bosch’s newest “Constant Response Circuitry” technology. What this does is that it guarantees the same speed during intense load. Bottomline, you can get a professional, standard and linear routing result on your material similar to industrial routers with this model. We like this feature very much and wish most router manufacturer will start implementing it. The Bosch 1617EVS comes only with a fixed base. To get both the plunge and fixed base combo kit, you will need to get the Bosch 1617EVSPK model. It has the same specs but comes with a plunge in addition to a fixed base. The fixed base of the 1617EVS is made from lightweight and durable aluminum. The handles are very ergonomic and extended to the side creating a wide opening - so as to offer a comfortable holding position while limiting hand fatigue. It is made from wood but has a glossy transparent coat on it. We like how it feels in the hand. The motor pack fits inside the fixed base perfectly well and there is no wobbling or squeaking. It will fit with an audible click. There is no way to put the motor pack the wrong way as it will not allow it. In addition, you can reverse the position of the motor pack to change hand position - so both left and right handed users are welcome to use this model. To remove the motor, simply pull a latch. This latch system is very user-friendly and makes removing and fitting the motor pack inside the base easy and seamless. The 7” fixed base offers a lot of stability and support to the router. It also has a top clear-view which means that you can watch over your routing at all times when used as a handheld router. If you want to affix this base to a router table or lift, it has industry-standard threaded holes for this purpose. You simply need to bolt it to your table and you’re done. Finally, this fixed base offers an exceptional precision of 1/64”. The depth adjustment is easy to calibrate by simply turning the depth-adjustment (micro fine adjustment) knob at the back of the router. This is a lifesaver for many who need a quick and precise depth adjustment. It has clear markings, with white markings on a black background for good contrast. You can easily tell the bit depth with a quick glance. This model accommodates both 1/4” and 1/2” chucks. What this means is that it will fit 100% of all router bits available on the market - if you currently own a few of them, you can start using your router bits right away with this model. Out of the box, this model will be fitted with a 1/4” collet and it comes with 2 wrenches for changing the collet size. It is a purely mechanical system that allows you to secure and tighten the collet to your liking. There many adjustments in this router that can be made and Bosch makes them incredibly easy and user-friendly. The micro-fine adjustment knob for the bit depth is easy to use and allows the user to calibrate the bit up to 1/64” accuracy. The motor pack can be placed in both directions to accommodate both left-handed and right-handed users. Removing the motor pack simply requires lifting a latch and securing it back in place. The router bits can easily be fitted or removed from the collet without much effort. The collet itself can be replaced with the provided collet wrenches. This makes it extremely versatile and allows you to experiment with an unlimited number of router bits and collet sizes for varying results. Rugged Motor Housing: The motor housing has dimples and a rugged design to promote handling. It feels comfortable and will not slip under heavy-duty routing. Weight: It weighs only 11.2 lbs which offer great maneuverability when used as a handheld router. It is also very portable. Quick Clamp System: Changing or moving the base is very easy and does not require additional tools. You get the absolute basics with this model. It does not come with spare parts or elaborate accessories. Out of the box, you will find the motor pack, 1x fixed base, 2 wrenches for the collet, 1x 1/4 inch collet, 1x 1/2 inch collet, a chip shield, and a height adjustment wrench. Bosch provides all the mounting hardware including bolts with this purchase. The Bosch 1617EVS is quite affordable for the asking price. It is powerful and has a nice set of features that woodworkers will use and find helpful in their day-to-day routing. It is much cheaper than the Bosch 1617EVSPK combo kit that comes with an additional plunge base. Other than this, those 2 models are exactly the same - even the fixed base is the same. If you do not need a plunge base, and planning to fix this router to a router table/lift or simply use it for edge trimmings, you will save a lot of money by going with the Bosch 1617EVS. John from WorkshopAddict.co﻿﻿m made a very good hands-on review of the Bosch 1617EVS on his YouTube channel. He goes into details about the various parts of this router and tell us how and why he uses this particular model every day. In fact, he says that it is his favorite model. He likes the ease of use and the ability to make adjustments quickly and easily. Finally, he concludes the review by giving a demonstration of the router. His video will give you a good idea of what to expect before purchasing this unit. Powerful: The 2.25” 12 Amps motor performs well under any type of routing - including heavy-duty work. Variable Speed: The variable speed of 8,000 - 25,000 RPM is versatile and allows you to adapt to the material. Accuracy: The fixed based can be micro-fine adjusted to 1/64” for extreme accuracy. Stable Base: The base is made from aluminum which is durable and also large for stability. Router Bits: Accommodates both 1/4” and 1/2” collets. Threaded Holes: Easy fixation to a router table. Ease of Use: Very easy to use and make adjustments to. Does not come with a plunge base. 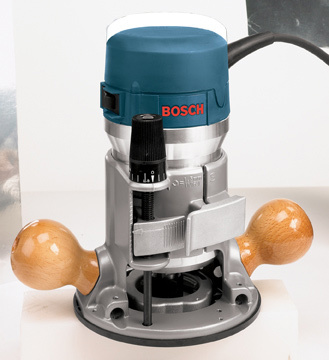 It is hard not to recommend the Bosch 1617EVS to anyone interested in getting a wood router. But we need to be more considerate with our recommendation. The only problem with this model is that it does not come with a plunge base. If you frequently make holes in the middle of material and require the versatility of a plunge base - this model is not for you. On the other hand, if you are planning to use this router with a router table or mostly make edge trimmings then it comes highly recommended. It is much cheaper than the Bosch 1617EVSPK that comes with a plunge base with the exact same specs.